He’s about 20cm long and can move extremely fast when alarmed (hence the “agilis” in his name?). But on a cool day the sun’s rays tempt him to just chill out and soak up the warmth. Hope you get some warm sunshine this weekend to soak up too! This entry was posted in Animals/Creatures, Garden, Nature, Wildlife and tagged Animals/Creatures, Garden, Nature, Spring, Wildlife. Bookmark the permalink. 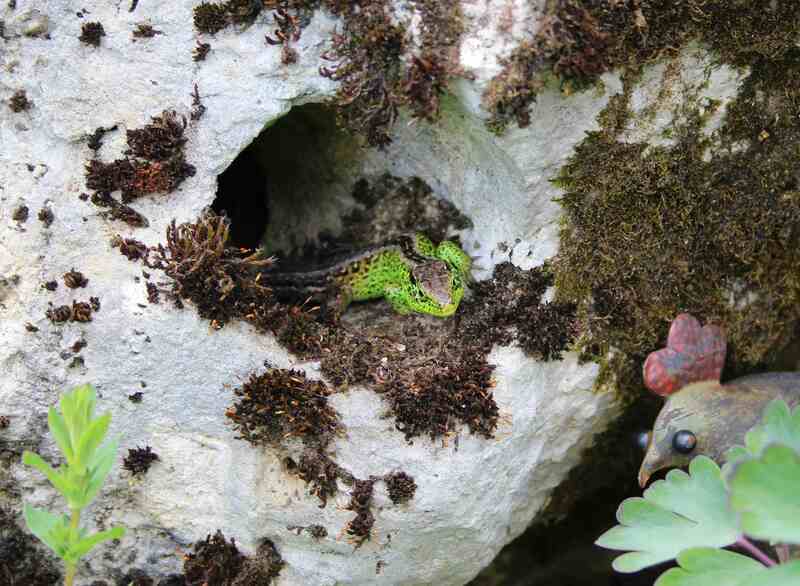 Does he stay green all spring or change colors instantly like many lizards do to blend in to their environment? Hi Karen. He only turns green in spring, for a couple of months, and then he goes back to brownish grey, like the female. The females are usually a little fatter than the males so you can still tell the difference. He can’t change according to his environment – but he blends in pretty well anyway! Have a nice weekend Karen! Fun. Hope he finds a nice mate. Stormy today but warm and sunshiny tomorrow. Happy weekend Cathy. His mate was just a few inches away, but hidden by some leaves, so I couldn’t get a photo. There are several in the garden, but these are the only pair I think. Happy weekend to you too Susie! It is amazing what is revealed when we really stop to look at our world. Hi Charlie – you are so right. I try and stop and look more often these days, and there is always something new! Have a nice weekend! A lovely zingy green! Rain today and showers tomorrow! Have a lovely weekend Cathy. Today we have bright sunshine and the trees are almost green. Hope you see some Uta – they are so cute to watch! It’s very warm and sunny here too. Have a lovely weekend! He impresses me too. He is beautiful. Creatures in the garden are always fun to watch. More often than not the best moments are – of course – when the camera is miles away! I often see them, but rarely have my camera at hand at the right moment! There is quite a lot of activity in the rockery at the moment… Have a good Sunday Annette! 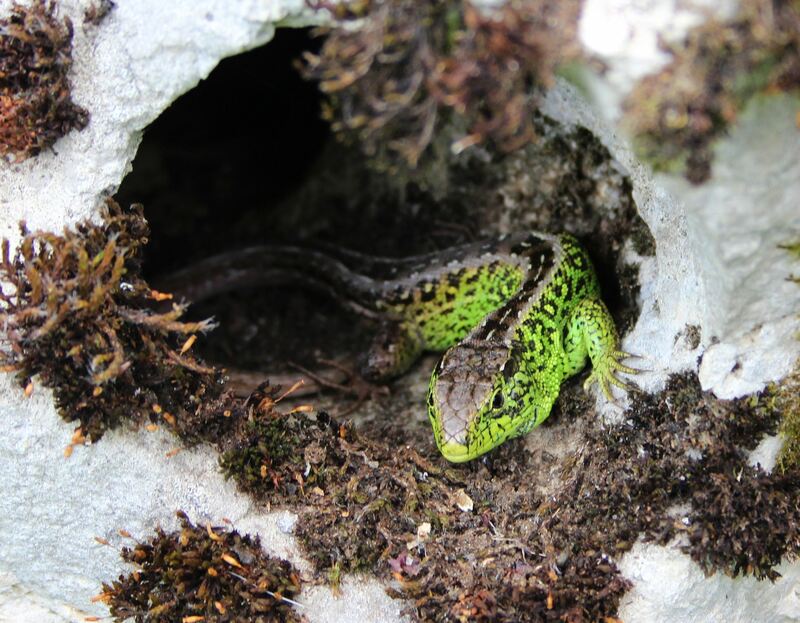 You probably have the European Green Lizards (Lacerta viridis) then, which we don’t get in our region – too cold in winter perhaps. A shame as they are really pretty! There are hundreds of different ones, some changing colours slightly and others not at all. Yes that sounds right. This winter has been so mild they have been active all the time, they are my constant companions in the garden. 😀 That colour makes him look quite exotic… shame it only lasts a couple of months! Hi Cathy, I had a male Jackson Chameleon just outside the door yesterday. Fierce looking bugger with three horns but his color of green was just stunning. Gotta love insect eaters. I just looked that up – does look quite dangerous with those spiky horns, but a beautiful colour! Thanks for stopping by Dohn! “Now you see me, now you don’t” – are the words tripping off his tongue. You are fortunate to have such a special visitor Cathy. I enjoy seeing them all over the rockery Anna. Hope to see some young ones later in the year too! What a cutie! He should have a TV commercial! What a gorgeous critter in his lady-pulling togs. Hee hee I like the middle picture (where he has his mouth open) best. Lovely shot! Thanks Simone! He really did look like he was laughing! I think it will be a good year for them as I keep seeing several at once! They are all over the place! 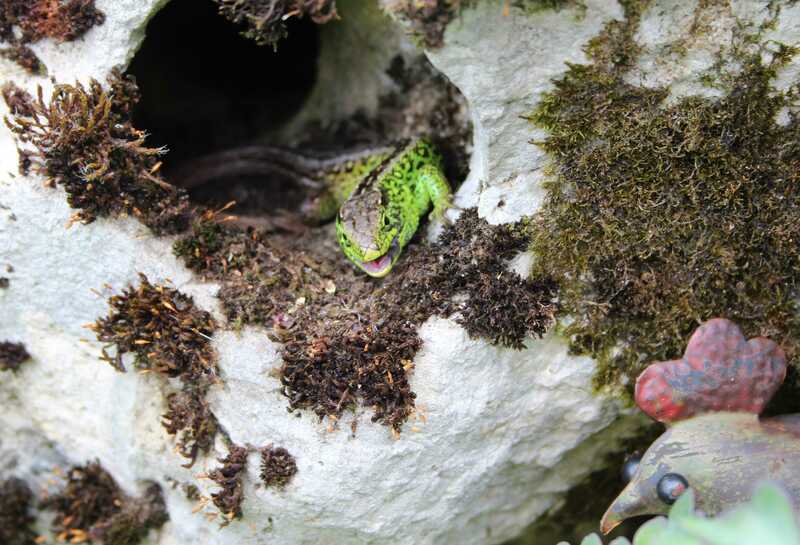 He’s been keeping a low profile recently… maybe he attracted too much attention, as there are quite a few female lizards in the garden too! LOL!